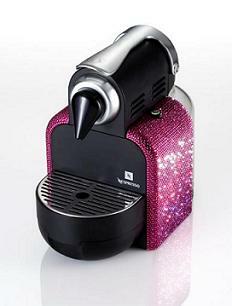 This isn’t the first time Nespresso has brought some red carpet bling to a coffee machine. This time it’s added some pink sparklers to the Essenza coffee machine and will be releasing a bunch in October to coincide with Breast Cancer Awareness Month. Moving away from Harrods to an equally plush retailer, Nespresso will be selling the limited edition bedazzled coffee machines exclusively through Selfridges. You can get the ultimate luxurious coffee experience, not to mention you’ll be adding some pizazz to your kitchen, for the not-so-cheap price tag of £699. Considering it’s heavily emblazoned with pink Swarovski crystals and you’ll be doing your bit for charity (all donations go to Breast Cancer Haven), it sounds like a very fair price tag.